Which Pet Strollers for Medium Dogs Are the Best (2018)? If you have a dog, you’ll understand that it’s nice to take them with you when you venture out of the house. Whether you’re going for a jog around the park or running some errands locally, your furry friend doesn’t have to miss out. Dog strollers are a great way to help your canine pal get out and about with you. They’re especially useful if your dog has mobility problems, or trouble walking for long distances. If you’re going to jog a punishing 20-mile route and aren’t sure if your dog can make it all the way, a stroller provides the answer. 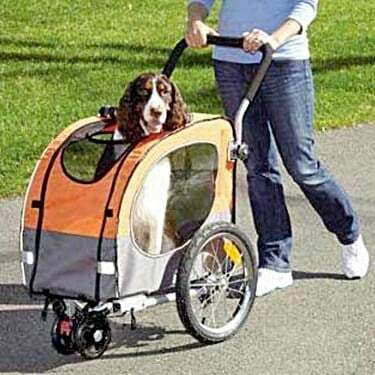 There are a multitude of dog strollers on the market, with many of them offering specialist features to fit your needs. Whether you like leisurely strolls, power walking or walks over rocky terrain, there’s a dog stroller model to fit your needs. In this guide, we’re going to take a look at some of the best dog strollers for medium-sized dogs. We’ll determine whether your particular dog is classed as ‘medium-sized,’ and we’ll look at some of the best models on the market for a variety of needs. 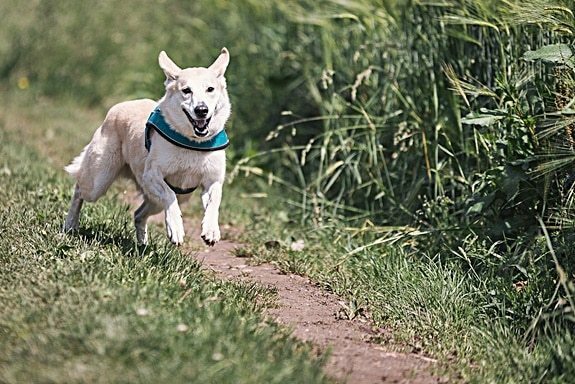 If you’ve ever wished your dog could accompany you on long, relaxing walks or runs, read on! 1 What Are the Benefits of a Dog Stroller? 3 What Are the Top Dog Strollers for Medium Dogs? 4 Which Dogs Are of an Average Size? What Are the Benefits of a Dog Stroller? Some people might think it’s strange that you choose to push your dog around in a stroller like a baby. But, dog strollers have a multitude of benefits – both for the dog and their owner. If your dog is recovering from an injury or has a recurring ailment that hampers their physical activity, a stroller can be perfect for them. Dogs love fresh air, and they shouldn’t be confined to the house just because of their injury. Strollers allow them to enjoy the great outdoors without putting too much stress on their injury. Older dogs can benefit from strollers. Senior pets still love going on adventures, even if they can’t walk as far as they used to. A stroller is ideal for giving them a break if they need it, ensuring they won’t become exhausted while they’re walking. You may find yourself wishing for a stroller if you’ve ever taken your dog to a busy place. Even when on a leash, dogs can be at risk of being stood on or knocked with bags. A stroller keeps them safe in crowded areas. Having a dog stroller opens up the possibilities for places you can take your dog. You can enjoy al fresco meals or coffee with your friends without worrying about where your dog is and whether they’re peeing up the leg of a chair. You can take them to outdoor festivals or events without constantly having to check on them. Pushing a medium-sized dog in a stroller around whenever you go for a walk is a great way to stay fit. It’s almost like weight training – you’re adding extra weight to your load when you go out for a jog or a brisk walk. You may notice that you become fitter and healthier when using a dog stroller regularly. As you can see, the benefits of owning a dog stroller are great. Let’s take a look at some of the things you should consider before buying a dog stroller for your medium-sized dog. As with any large purchase, you want to make sure you invest in the right product. To do that, you’ll need to answer some simple questions first. This will help you decide what you want to get out of your dog stroller, so you can narrow down the many options that are out there. How will I use this stroller? Think about what the primary purpose of the stroller is before you take the plunge. Will you be using it for short trips to and from your local stores? Or will you be using it for lengthy powerwalking sessions with your friends and their dog strollers? What terrain will I be covering? If you only plan to use your dog stroller on paved streets and sidewalks, you can filter out the strollers designed for hikers. Whereas if you want to take your dog on rocky paths and hiking trails, you’ll need to look at things like suspension, wheel size, and durability. How big is my dog? Dog strollers exist for canines of all sizes, from teacup puppies all the way up to Great Danes! You’ll need to think about how big your dog is now, and whether they’re fully grown. There’s no point buying a stroller that suits your puppy, only to discover it no longer fits them comfortably six months down the line. What is your budget? Obviously, budget restrictions will be a big factor in choosing the dog stroller for your medium-sized dog. Fortunately, there are great strollers available in every price bracket, so you don’t necessarily need to spend thousands to find a great fit. What Are the Top Dog Strollers for Medium Dogs? Once you’ve weighed up the questions above, you should be ready to start browsing options for your dog stroller. The Pet Gear NV Pet Stroller is a top-of-the-range dog stroller that’s ideal for dogs weighing up to 70 pounds. This covers most dogs in the ‘medium’ category and should give them plenty of space to move around and stretch. This particular stroller’s star feature is its no-zip entry. You won’t spend your time struggling with zippers when trying to secure your dog or let them get out. This is especially great in wet weather when zippers can become slippery and difficult to use. 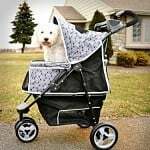 Instead, the stroller has an easy locking latch which keeps your dog safe and secure and is very simple to open and close. Another great benefit of this stroller is its 12” ‘Air Ride’ tires. 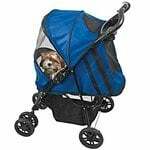 This makes the Pet Gear Stroller one of the best on the market for running or jogging with medium dogs. It’s perfect on rough terrain and can keep the stroller comfortably level when you’re running or jogging. You can also lock the front wheels for extra stability when moving at speed. The interior of the stroller comes with a variety of great features to ensure your dog has a great time on every walk. The panoramic window has a triple-position canopy, so they can always view their surroundings. There’s also an elevated paw rest inside, so your pup can stand up and see what’s going on around them if they wish. A bolster pad and weather cover are included in the kit, making comfort and cleanliness top priority. The Pet Gear NV Pet Stroller comes in a wide selection of colors, and assembly is easy. All you need to do is attach the wheels, and you can start walking, jogging, hiking or running straight away. With the ability to carry dogs up to 50 pounds, the Gen7Pets Promenade Pet Stroller is an ideal choice for those with small-to-medium dogs. 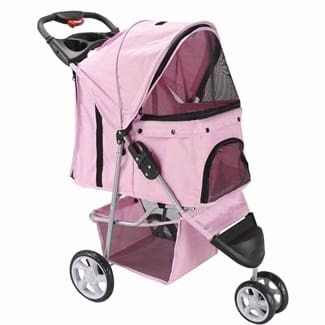 Dogs like Beagles, Border Collies, Dalmatians and most Spaniel breeds will fit into this stroller with room to spare. The stylish design is packed with smart features. It has a canopy which can be opened to expose your dog to the open air while keeping them secure. This helps them to feel more involved, rather than being kept behind mesh barriers all day. An ergonomically-designed handle ensures you have plenty of kick space when walking. This allows you to keep your arms at a comfortable height, as well as maintaining a good pace. That might be why it’s called the ‘Promenade’ stroller. The Gen7Pets Promenade Pet Stroller also comes with a basket and a rear zipper so that you can secure all of your belongings safely. This is great if you’re running errands – you can carry small items, keys, wallets and other essentials in the stroller within easy reach. There’s even a cup holder. If you’re constantly putting the stroller up and then folding it down, you’ll enjoy the smart folding mechanism. This allows you to quickly and easily fold the stroller from the handle, rather than fiddling around with clips and release latches. As disadvantages go, this stroller has very few. Perhaps the only thing that needs to be considered is the length of your dog. If you have a Dachshund dog, you might need to leave the front mesh section permanently unzipped to give them adequate room. 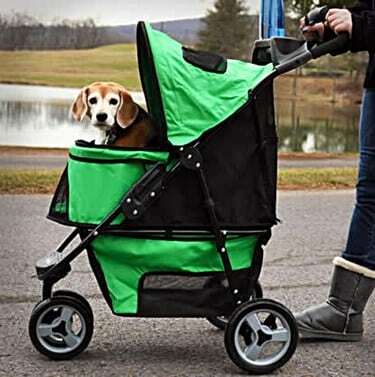 This stroller is another model from the popular brand Pet Gear. If you’re looking for a stroller that can handle all types of terrain, this one should be on your shortlist. It has the classic Air Ride tires that many Pet Gear strollers have, which means it can cope with rocky terrain and rough ground. The front-locking swivel wheel provides great stability. The 11.5” inch wheels will go over most terrain with no problem, including grass, gravel and dirt paths. The rear shock absorbers are also ideal. They provide support for your pet when you’re hiking or moving at speed, so your dog won’t be bouncing around with every step. The stroller also features a quick-lock foot brake, for those moments when you need a rest. The AT3 Generation 2 stroller comes with a removable liner, so it’s easy to keep it clean. If your pet gets muddy and gets dirt all over the stroller, you can simply take out the lining and wash it with hot soapy water. 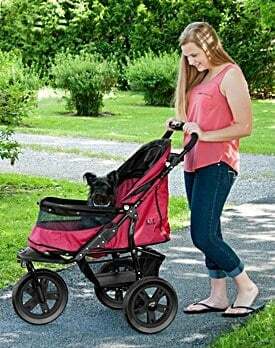 Pets up to 60 pounds can be accommodated in this top-of-the-range stroller. They’ll have plenty of room to maneuver around inside the stroller, and the canopy allows them full panoramic views when they’re strapped in. This three-wheeled pet stroller is also perfect for those who like to run or jog with their dogs. It can hold dogs up to around 40 pounds, so small-to-medium dogs are the perfect size for this stroller. It’s manufactured to amazingly high standards and is currently a best-seller with great reviews. Many happy customers comment on the quality of the components, and on how easy it is to set up. The OxGord 3-Wheeler comes with all the features you could ever need to keep your dog safe and comfortable. There are seat belts within the stroller, and a hooded peak top window so your pet does not feel shut away from their environment. The rear security brake and single hand folding make this a great stroller for everyday use. It even comes with two cup holders so you’ll always be hydrated when you’re out on a hike or a run. Many people worry about tics and other insects when they take their dog to a park or into the woods for a hike. The mesh on this stroller’s windows provide great ventilation as well as protecting your dog from bugs. There’s also a great undercarriage storage section so that you can keep essentials with you. This might be toys and treats, or it could be your essentials like your purse and your phone. Entry to this stroller is easy – your dog can choose whether they get in through the front or the back. There’s also a retractable waterproof rain hood, so even if it’s pouring down with rain, you have no excuse not to get outside and enjoy the great outdoors with your dog! Which Dogs Are of an Average Size? All of the strollers listed above are suitable for medium dogs. This is usually defined as dogs between 40-60 pounds, and standing at a maximum of 22 inches tall at the shoulder. Here is some info on other breeds of medium-sized dogs. If your dog falls into one of these categories, the strollers listed here would be perfect for them. Some strollers come in a variety of sizes, and it’s important to choose the right one. Here are some top tips for measuring your dog to ensure you get the right-sized stroller. First, grab some measuring tape and ask your dog to sit down. Measure from the very top of their head to the floor to get their height. Then, to measure their length, measure from the tip of their nose to the point where their tail starts. You don’t necessarily need to measure their tail, as they can curl it around and under themselves. Once you have your dog’s measurements, you should add a couple of inches to that. You don’t want them to be tightly cramped into the space with no room to move around. They’ll need some extra inches so that they can turn around, sit, lie down and stretch. You should also weigh your dog. Some dogs can be relatively small, but extremely muscular. This might affect the type of stroller you can choose for Staffordshire Bull Terriers, for example. Likewise, some dogs can be quite tall, but very lean and slender (like Whippets). Now that you know the measurements of your dog, you can choose the right size stroller for their requirements. Pet strollers are a relatively new invention, but they’re fantastic for those who like to keep their pets close by. Senior dogs and dogs with injuries can also benefit enormously from these wonderful products. It allows them to continue to enjoy a sense of freedom, even if they can’t run, jump and play like they used to. Choosing the right stroller is important. If you don’t choose one that fits your requirements, you’re not likely to use it, and you’ll have wasted money on it. If the stroller ticks every box, you’re more likely to want to use it to take your dog out every day, or at least a few times per week. Make sure you consider factors like size and budget when choosing your stroller. You should also think about what you plan to use it for. Will you be using it to take your dog on challenging runs over long distances and rough terrain? Or will you be sticking to the sidewalks and using the stroller for occasional errands? Whichever stroller you choose, we hope you and your furry friend find great enjoyment in it. What Are the Best Pet Strollers for Small Dogs?